This is a roulette guide for one of the rarest forms of online roulette that you can find: Mini roulette. This style of the game, as opposed to other types of roulette, is based on the numbers 0-12 instead of 0-36, and it has a much smaller, cleaner play area that a lot of players are fond of. The simplified layout has a grid of four rows of three numbers apiece, but you still have all of the usual outside bets that you might expect. With that having been said this version of real money roulette focuses more on the inside bets, and we're going to break down everything you need to know about them to have all of your options in front of you. The first thing you need to learn about this game is how to figure payouts. This is the most critical of any roulette tips we could offer you since it'll be something you use repeatedly through the remainder of this post and through all of your play in mini roulette. 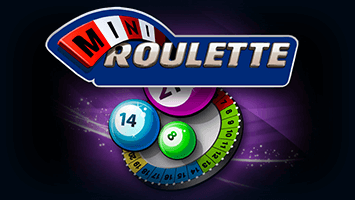 To find the payout of any bet in the mini version of online roulette, you start by dividing 12 by the number of spots that will win for your wager. Subtract one from what you get, and you have your total payout rate. It's a very simple process, and it's something you should always make sure to practice in free roulette games before you take it to the real money roulette wheel. Let's use this shortcut to break down some of the common bets in this game as a sort of walk through being your own personal roulette guide. Everything starts with a bet on a single number. Divide 12 by 1 to get 12, and then subtract 1 to get 11, and now you know your payout for betting on a single number is 11x. If you bet £1 and win, you'll profit £11. What about a split bet on two numbers? Do 12 divided by 2, and then subtract 1 to get a total of 5x. It's that simple. So what other bets are there in this game? It's obvious that the bets on red, black, even and odd pay out 1:1. So how does that work with this system of calculating payouts? Each of these pays for six spots apiece, so divide 12 by 6 to get 2, subtract 1 to get 1, and you know your profit is 1x on any of these even money bets. We want to point out that you can use the same shortcut for 36-number games like those found in a live casino if you start with a base of 36 instead of 12 in your calculation. There are three special bets that really matter in this game, and along with all of the roulette tips we're giving you, we're going to break down what these bets are, how to make them and what the payouts are like. We suggest you try these wagers in free roulette games first so that you know you're placing them correctly. The row bet is a bet on three horizontal numbers. It pays out 3x, and it's also the only regular wager in the game that has a 3x payout rate. The column bet is a wager on four vertical numbers, and just like in 36-spot styles of roulette, it pays out 2x. For further information about roulette strategies and game explanation, click here.